Miyasaka is a rarity in Tokyo, steeped in the seasons, flavors and colors of Kyoto kaiseki cuisine. 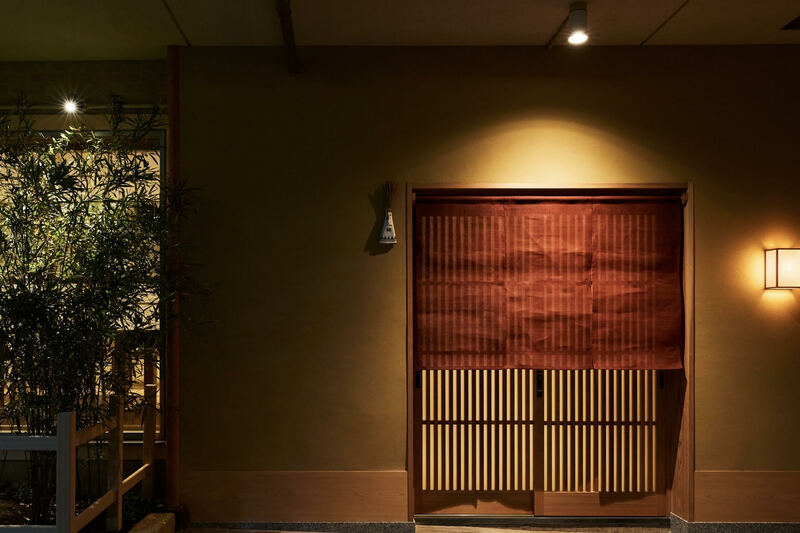 From the chic interior and stunning presentation, to deep flavors that speak of the season, and warm hospitality, Miyasaka envelops you in a true Japanese dining experience, exemplifying the beauty of this unique and intriguing culture. A short stroll away from the busy Omotesando boulevard filled with fashion designers and luxury goods stores, you can find the quietude of Minami-Aoyama and the Nezu Museum of Art. Just across from the lovely bamboo garden is the hidden treasure of Miyasaka. Light escapes through low windows casting a glow on the wet stone pathway that leads you to the door. Without words, your only guide is the floral crest engraving on a beautiful wooden panel at the front. The modern interior is plastered entirely in black shikkui, the traditional Japanese stucco made from lime and eggshells known to have many benefits for air quality and hygiene. In this dignified space with just eight counter seats, the chef is so engaged with his guests each day that he only does one sitting. The solid textured timber of African teak fits perfectly with the chic black interior. The black walls also provide the perfect backdrop for the chef’s own ikebana, bringing colorful brilliance to this otherwise subdued space. In a copper grill, charcoals are fired for the grilled elements of the menu, wafting delicious aromas to guests who wait anxiously to devour the next morsel. With utmost attention to the seasons, Chef Miyasaka endeavors to draw the ultimate in flavors from each ingredient to create stunningly beautiful and truly delicious kaiseki cuisine. 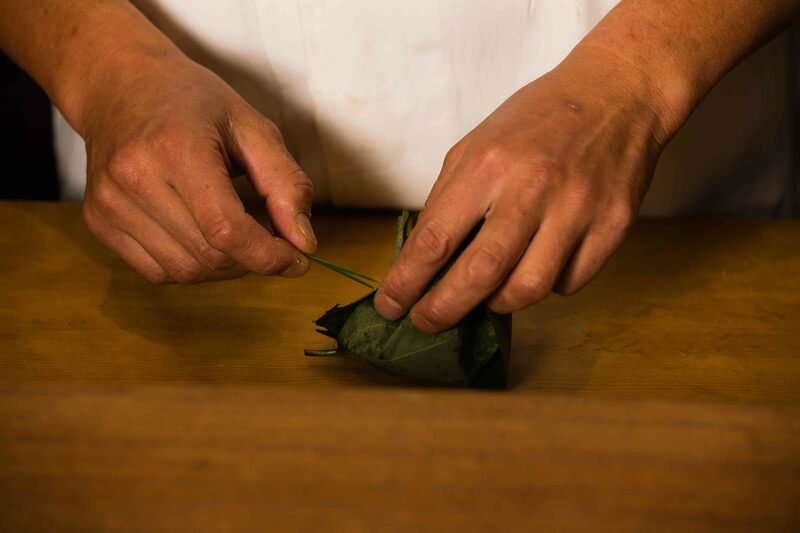 Having studied tea ceremony for many years and placing high value on traditional Japanese arts and crafts, Chef Miyasaka works to bring those elements to life in every dish he creates. The hassun course in kaiseki is designed to walk guests through a story of the season showcasing its premium ingredients and offering tastes that can only be enjoyed at that place and in that moment. Miyasaka’s hassun is breathtakingly beautiful and delicious, and takes you on a journey to the mountains and the seas as you mindfully devour each bite. 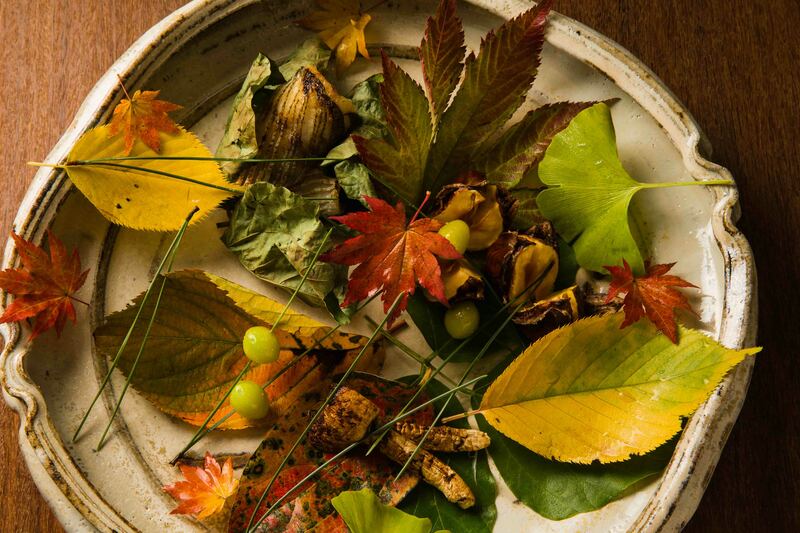 Amidst a stunning brocade of autumn leaves, an early autumn hassun may include grilled parcels of barracuda wrapped in arrowroot plant leaves, deep fried chestnuts, glistening green ginkgo nuts skewered on pine needles, and the heady aromas of chargrilled matsutake mushrooms. Seasoning, heating, placement – everything is perfect. And to close the meal, you can savor the simple pure flavors of white rice cooked in an earthenware pot. 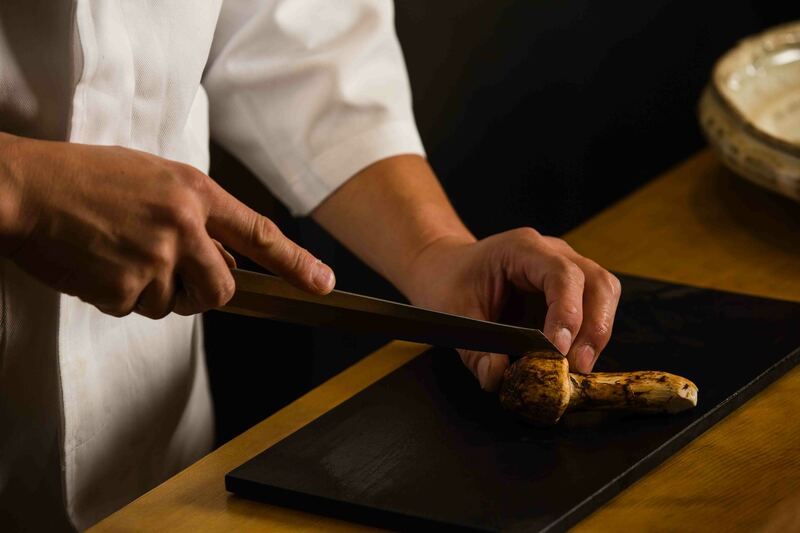 Chef Miyasaka frequently visits producers, solidifying his relationships with farmers and fishermen who send direct to the restaurant from all around Japan. Miyasaka also often visits Tsukiji searching for the freshest seafood. The shift from Kyoto to Tokyo initially made procurement of many ingredients more challenging for Miyasaka, but help from close chef friends in Tokyo means he can now get whatever he needs, for which he is very grateful. Ingredients that speak of the season and are only available for a very short time, however, are still much harder to secure in Tokyo than Kyoto. Rather than being frustrated, Miyasaka sees this as an opportunity to tread foot in new regions of Japan to discover what lies within. 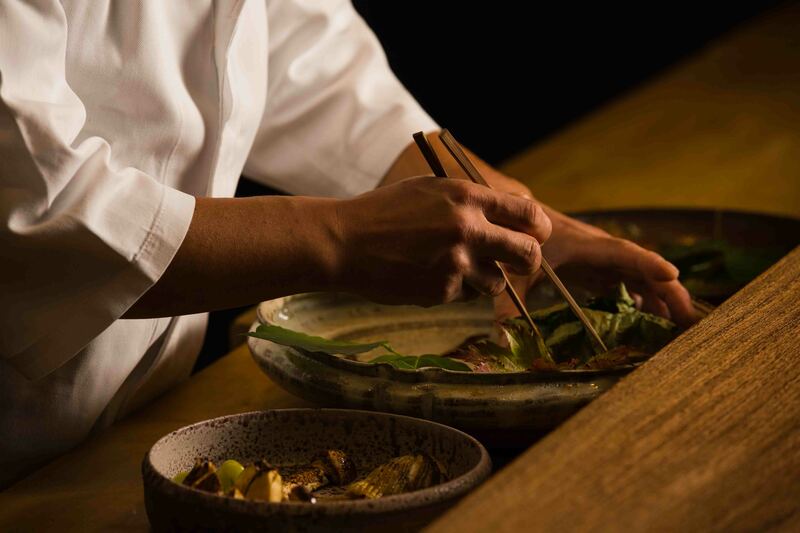 Excitement spread fast with the word that after 10 years of training at an exclusive starred kaiseki restaurant in Kyoto, Chef Nobuhisa Miyasaka would be returning to his hometown to present his take on Kyoto Kaiseki. Thoroughly dyed in the colors of Kyoto, that profound influence shines in his cuisine setting it apart from other kaiseki restaurants in Tokyo. Miyasaka was born into the food industry with parents who ran a Japanese restaurant in Shinjuku. He visited the restaurant often and took deep interest in their work, thus his own decision to become a chef was an entirely natural one. After high school he enrolled at Shinjuku Chori culinary school, and while he didn’t specialize in washoku, his first full-time job was at a tempura restaurant greatly shaping his path forward. He acquired the basics before moving on to train and study at several restaurants until age 30 when he received an irresistible invitation to join the kitchen of a newly opening restaurant in Kyoto. Miyasaka says this is where he began his true culinary training, working directly under the newly independent chef, and gaining entrance into the elusive world of Kyoto cuisine. During his 10 years there the restaurant earned three stars. And Miyasaka found the confidence to go out on his own. Just two years have passed since he embarked on his dream to serve authentic Kyoto cuisine in Tokyo. Frequently returning to Kyoto to brush up his skills and knowledge, Miyasaka loves to spend spare moments in the metropolis of Tokyo exploring the streets for inspiration. 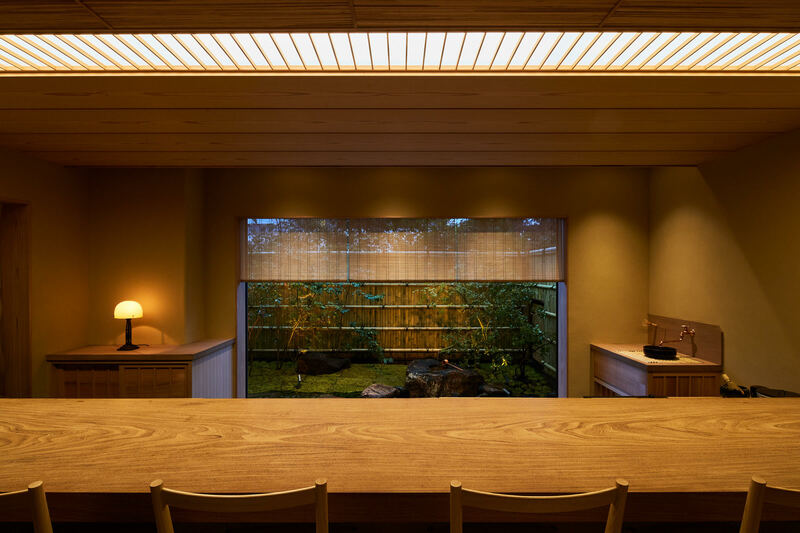 Miyasaka’s focus is very much on making his own restaurant a truly wonderful place. Already almost impossible to get a reservation, Miyasaka is not content and will not let go of the tension that pushes him constantly to serve ever more amazing food. While his vision doesn’t reach too far into the future just yet, his passion is clear and the satisfaction of hearing guests’ positive responses to his cuisine drives a desire to share that more broadly in some form someday. 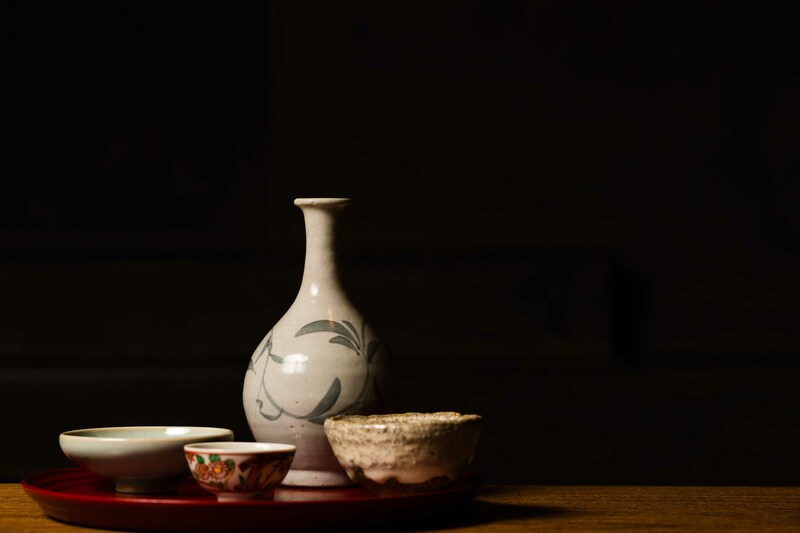 Miyasaka’s collection of pottery, porcelain and lacquer tableware began when he started his own restaurant just two years ago, and yet it already contains many magnificent and eye-catching pieces. Visits to artists’ exhibitions and kilns has taught Miyasaka much and sparked a deep interest in the craft that carries his exquisite cuisine. 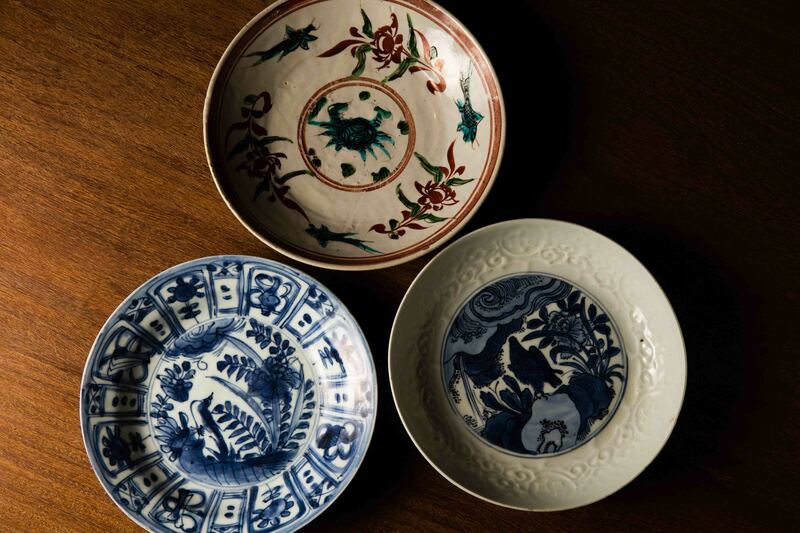 Among his favorites are a large plate by Karatsu ware artist Sakurei Okamoto, which has a classic feel with earthy tones and a creamy glaze, as well as antique Edo Period Imari-yaki – a type of Arita ware from Kyushu characterized by blue and white designs including vivid landscapes. One piece that Miyasaka holds especially dear is a late Ming dynasty porcelain dish made in a style called gosuakae, known as Swatow ware in English, famous for large open forms decorated with dynamic brushwork featuring the color red, but also incorporating green, turquoise and black enamels.